Special Olympics North Dakota serves athletes, partners, coaches and other partners through twelve Area Programs in the state. We offer sports all year round with weekly practices, periodic games and annual tournaments. Whatever your interest in Special Olympics, we’re excited to have you join us make a real difference in people’s lives. The Bismarck program (Area 10) is run by a core group of local volunteers, known as the Area Management Team (AMT). The AMT helps maintain the local programs activities, from practices and tournaments to local fundraisers and outreach. 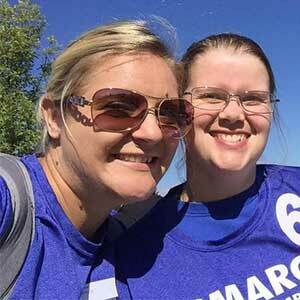 The AMT relies heavily on local volunteers and supporters throughout the Bismarck area. 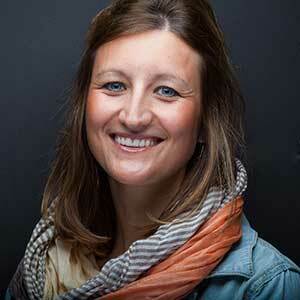 Marisa has been with SOND-Bismarck for five years. 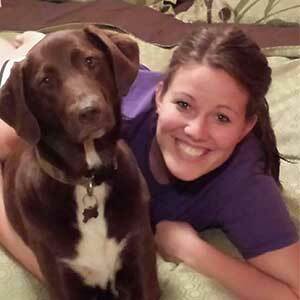 She has enjoyed helping with Basketball, Volleyball, and Soccer. She most enjoys watching the excitement and enthusiasm that the athletes have during each sport, and being a part of that experience with them. 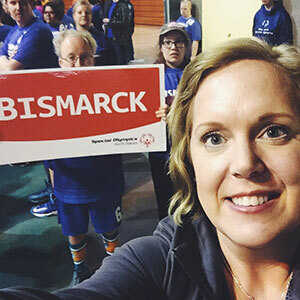 Although she knows she is supposed to be the one making an impact on the athletes, she often feels like she is getting the most out of Special Olympics. Petra has been a part of SOND-Bismarck for more than 10 years filling in wherever she is needed. Her favorite part of the organization is the athletes, “The everyday grind and worries fall away when I am with them,” she’ll tell you. Others should get involved with the organization because after volunteering all her life, “Working with Special Olympics has been the most rewarding experience. Volunteering in your community is so important, and Special Olympics offers many different opportunities to do so. It can be a small or large time commitment. Angie has been involved with SOND-Bismarck for 11 years. During that time, she’s participated in basketball, volleyball, and soccer. She says what she enjoys most of volunteering with Special Olympics is seeing the athletes smile regardless if they win or lose. She affirms that everyone can learn a lot from the athletes. When asked why others should get involved with the program, she’ll tell you, “Whether or not someone is, “good” at sports, it doesn’t matter. The athletes love and appreciate every single coach and volunteer they come into contact with. They have the biggest hearts you will ever find, and teach us to see the world in a better, more positive light. Volunteering for Special Olympics helps you appreciate life and embrace everyone’s differences. And apart from helping athletes, you will also gain friendships with other volunteers and become part of a community that is unique and unforgettable. 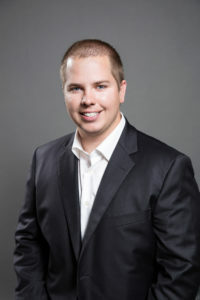 Nic has been with SOND-Bismarck for over 20 years. He has coached basketball, bowling, soccer, Track & Field and Volleyball. He has also partners in both soccer and volleyball. He says what he enjoys most about Special Olympics is that athletes are just as excited getting a first place medal as they are receiving an eighth place ribbon; then running up to you yelling, “Coach, look!” with a beaming smile and feeling of pride. Pat has been with SOND-Bismarck since 1989 coaching Basketball, Soccer, Track & Field and helping with Volleyball and Handball. She says it’s a pleasure being involved with all the athletes and families in Bismarck. She may not coach anymore, but she enjoys the time as, “bus monitor” traveling with the athletes throughout the year. She thinks more people should get involved with Special Olympics because, “It’s a great and worthwhile time, it’s a part of your life that is rewarding to you and the athletes. There is always room for everyone from coaching and fundraising or just being there for the athletes to talk.